Yesterday evening in a bid to stay warm I put on just about every item of clothing I own (and much to my disappointment only realised once I was too far from home to turn around that I had a food stain on the very warm outer layer) and headed out into the brisk December air to see Brooklyn based Department of Eagles play a free instore at Rough Trade West. This was my first visit to Rough Trade's West London store and it took some finding (I get lost in London very easily even after living here for 11 years) but I finally made it and managed to get down into the incredibly small basement area where the gig was happening literally seconds before the place got jam packed. 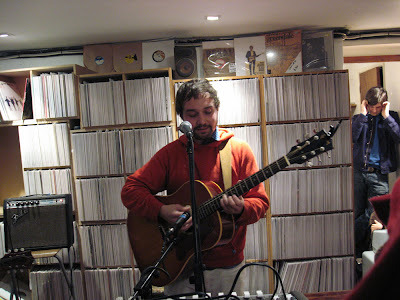 I spotted singer Daniel Rossen talking with a couple of fans and noticed he had a lot of paint on his jumper so I immediately felt better about my food stain, maybe even trendy? (nah!!) 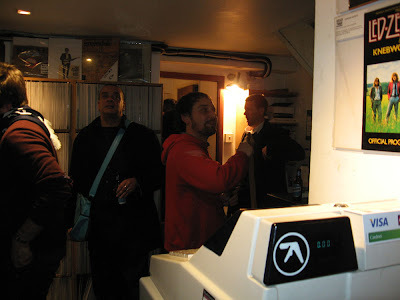 I was slightly perplexed as to how this gig was going to work, the audience of about 40 had already filled up the main shop floor (yes that's how small it was) and the only obvious area left for the band to play was behind the shop counter, which is exactly what happened. 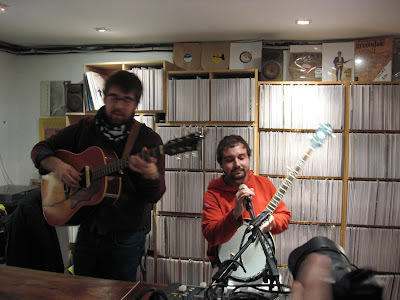 A slightly bemused Daniel Rossen and Fred Nicolaus appeared behind the counter supping on bottles of Argentian beer before launching into their stripped down acoustic set. I couldn't help but smile at the weirdness of the situation, it must have felt even stranger for them seeing us all at the counter like we were queueing to buy something. "I feel like I should be putting on a puppet show or something" said Fred. They played six or seven songs, some were off their In Ear Park album, one was introduced by Daniel as "being off their not so good first album", (their words not mine) and they finished with "Too Little Too Late" (a Jo Jo cover) which I thought sounded fantastic. The atmosphere was intimate and Daniels voice was stunning. While I stood there listening, I thought to myself how good it must have felt to have been him on the day he discovered he could sing, he really was that good - if I were him I would sing to myself for hours! Slightly miffed that I wouldn't be able to go to their sell out concert at The Borderline later this week, I headed off home and hoped I wouldn't get lost on my way to the tube station. Half way down Portobello road I walked past a lady who was also making her way back from the show and we started chatting. Turns out that this lady is the singer in Alessi's Ark who incidentally are doing an instore show at Pure Groove on December 11th. It was lovely to meet her and she kindly showed me where the tube station was which was a massive help and a great end to the evening. Wow, that sounds great! So looking forward to tomorrow! you are so lucky! i love dept of eagles. I can't believe you got to see Department of Eagles! It must have been amazing - you sounded like you had a great time. those guys are so weird. their first album is really good.